So, this is going up at the last minute Friday, but better late than never. I saw Thor, and have some thoughts to share, and have one thing to get out of the way first: Let's just say it, this movie isn't as good as Iron Man 2. There, happy? Don't discount it though, because it is still pretty darn good and definitely worth seeing. I won't give you break-down of the plot or anything because I figure you know all the details, I"ll just tell you why its worth seeing. 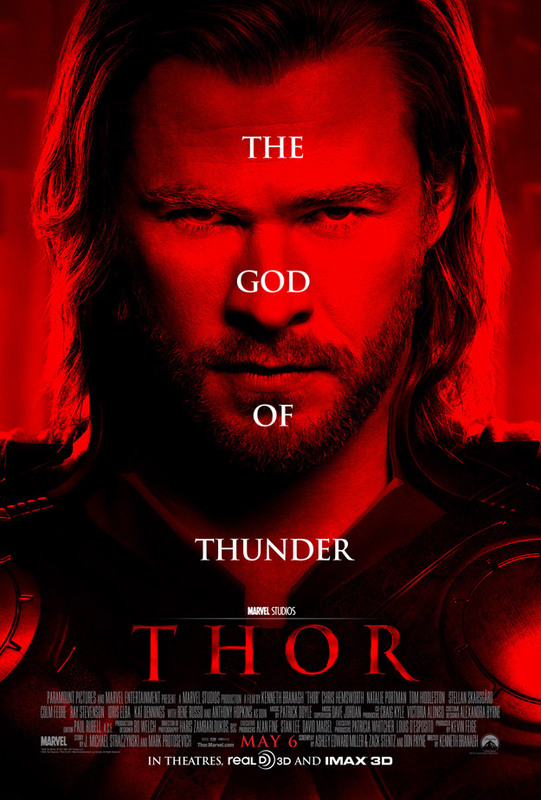 I was concerned how this movie would balance the fantastical elements of a viking paradise world and the real world, and for the most part the film, "Thor" succeeds. Lets be honest though, that first half-hour before he comes to earth does feel a bit like a generic fantasy movie--but once Thor touches down on our planet this film becomes some rip-roaring fun. As for the whole balancing-act? Well, the movie acknowledges the absurdity of a man claiming to be a God of thunder and Thor's seemingly-delusional nature is often the source of humor throughout the film. Speaking of humor, this film is loaded with funny moments, not to say it isn't serious too--it just has some great laughs. How was the acting? I'd say great all around. Chris Hemdall's Thor starts out cocky and by the end of the film seems to have truly grown as a individual, Natalie Portman has a smaller but well-acted role, and Tom Hiddleston absolutely kills it as Loki. Right when you think Loki is just some regular bad guy or you have his plan all figured out you get side-swiped by what he's really up to. It seems Loki may be popping up in the Avengers movie if what I've read it true, and I can only say I'd welcome that with much enthusiasm. The plot is pretty solid if not too amazing. Thor is cocky, banished to Earth, people are betrayed, folk fall in love, the character Hawkeye makes a very brief cameo, and a lot of stuff gets blown up. This was a really fun movie, I enjoyed it and would encourage anyone reading this to see the movie--but of course see the Iron Man flicks and Hulk movie first as they all tie together. Plus, as always, make sure you stay after the credits for a real treat that not only relates to the upcoming Captain America but hints at possibilities for the Avengers movie.